All of camp woke up to sunny skies and beautiful weather just in time to start another fun-filled day of scheduled activities! Our CITs set out early this morning for an overnight trip and some time away from camp. They will spend the next couple of days team building, bonding, and working on their leadership and communication skills. Walking around camp after the start of first period, one could witness campers practicing their form at volleyball, working on balancing techniques at the Ninja Warrior Course, discussing the composition of musical scores using Legos in the Music Shed, and cheering on some of their bunkmates during our 12U Girls Soccer Intercamp against Mataponi. Although we were not victorious, the final score was 2-1 with lots of impressive shots on goal and many close calls. Everywhere you looked today, campers were smiling, engaged, and having fun! This evening after dinner, campers were excited to hear about the fun activities their Unit Leaders had in store for them. 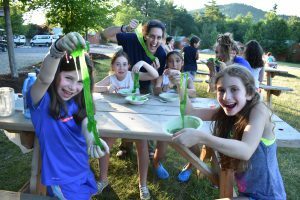 Some kids made green slime, others played Scatterball, and there was even a “Night at the Races” (fully equipped with inflatable hobby horses, of course!). Now everyone is cozy in their beds dreaming about what fun tomorrow has in store. Goodnight Bridgton and Sebago!